Hi all, I had an idea to build this artwork for my wife as a present since she & her siblings traveled around in a T1 as a family, anyways my wife did not want it however I finished it all the same. 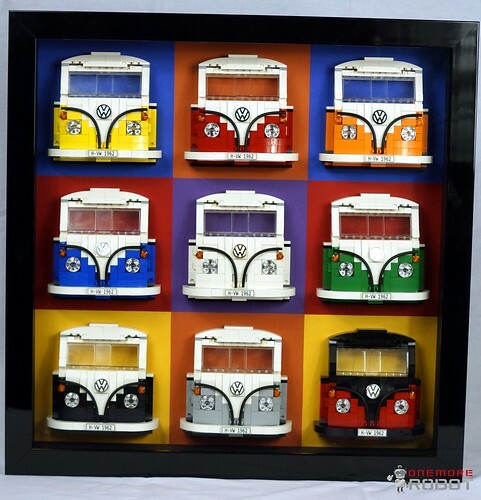 Contains several rare parts, especially green, has been professionally framed using museum quality glass. I exhibited it at the recent Sydney Brick Show (Australia) with a great response, thousands of photos taken of it with most comments saying it is 'Cool'. The number plates are engraved along with the VW emblems (chrome plated then engraved) plus chrome plated tiles under the headlights & indicators - thanks to Auri @ Chrome Block City. Thanks to Andy Warhol for the inspiration. Woah, really interesting. Reminds me of a mod shop decoration.